Ever wished there’s a way to check website status in order to always ensure it’s available for everyone? It can be traumatizing to think that your website is available not knowing it’s actually down, and you’re losing both traffic and money. In this article, you’ll learn how to check if a website is up and running for everyone. Today, websites have become an integral part of our daily life. Not only does it allow us to perform business activities but enable us to interact with others, check vital information, and share our thoughts about a particular issue from the comfort of our home. The rate at which new websites are created today is indeed alarming and most new webmasters usually have little to no experience on how to manage and monitor their website performance and availability. Nevertheless, if you’re new in the system who does not know how these things work, this article is aimed at teaching you how to always check your website status. Before we start, I want you to understand that choosing a good web host for your website is also as important as ensuring that it is accessible worldwide as a single downtime of your site can cost you a whole lot. However, you don’t need to be afraid because there’s already a way out. And the good thing is that you do not have to spend a dime before carrying out all the tips we’ll show you here. That said, below is how to always check website status online and the tools to use if you discover it is online but not accessible. First thing first is to test your internet connection to ascertain that it is working. If your internet connection is down, you won’t have access to your website. Well, you can check the internet connection by visiting another website you haven’t visited. Perhaps you can try Google to check; if the page is the same, then it means your internet connection needs fixing. If the internet connection is okay, you may consider refreshing your browser or using another browser. In some situation, the primary culprit is the browser. If after refreshing it still doesn’t work, then you have to try another browser. However, if the website opens in the other browser, then you have to clear your browser’s cache in your first browser used. If this does not solve the problem, then you need to reset the browser to its default setting. If you need a straightforward tool to check if a website is up or down, this will be a perfect choice. Just enter your domain name to the provided search bar, which you’ll see in between the words “is” and “down” and press the Enter key on your keyboard. The next page will reveal to you if your site is up or down without any extra details to support the result. After testing different alternatives to this tool, I discovered that it provides one of the most accurate results. So you might want to try this one out first before checking the other tools I’ll mention here. “Are My Sites Up” is the best choice if you have more than one website but can’t afford to pay for a premium Pingdom account, this is an amazing website monitoring tool. With their free account, you can easily monitor and track up to 5 websites with 25 daily checks. That’s not all, they equally have a premium service that lets you monitor and check more websites. You can get alerts through text message, RSS, e-mail, Twitter, or through a slick iPhone application. 3. Is It Down Right Now? 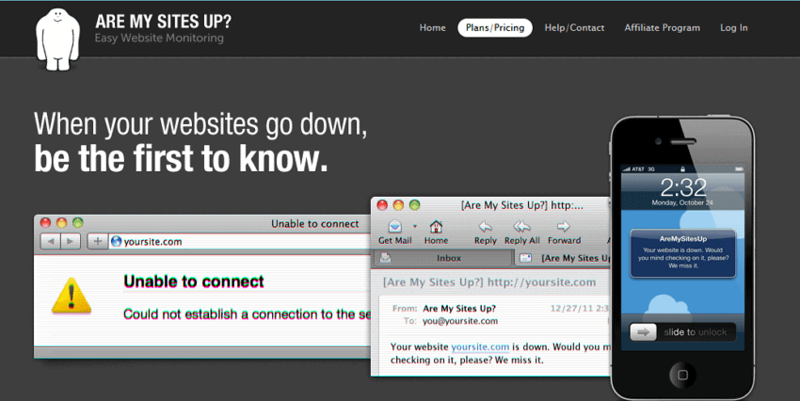 This is what you’ll see once you land on the “is it down right now” homepage. You’ll find a search bar at the top, which is where you’ll enter the URL of your website, as well as the list of sites that the tool has checked so far. Once you check a specific website, in this example, I just went with HostingMonks.Com, you will get a personalized status check, as well as a history of IIDRN’s automatic checkups. With this information, you will be able to know whether it’s the Internet, or if it’s you. This is a bit more advanced website monitoring tool compared to the other ones listed here because it has the ability to check different protocols including HTTP, HTTPS, POP, SMTP, UDP, and FTP. For a normal website, it’s recommended to use the HTTP or HTTPS check where you’ll have to select the request type either POST or GET, login credentials along with additional parameters for POST, GET, and headers. The website will be checked automatically with about 19 checkpoints from eleven countries. 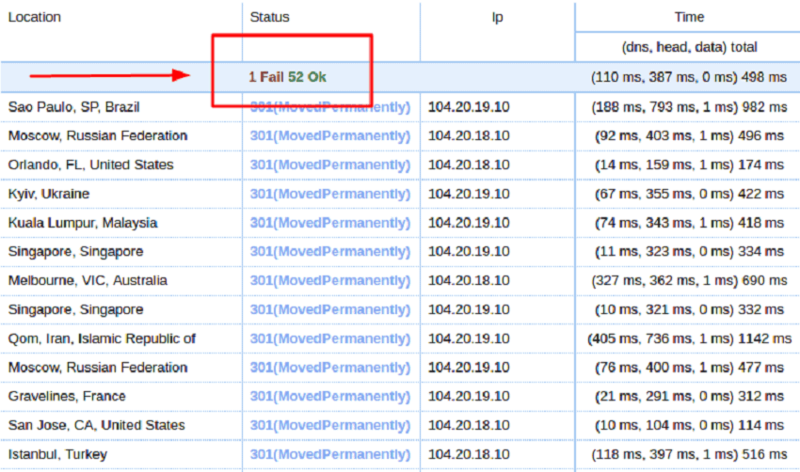 To figure out if a site is up or down using “DotCom-Monitor Instant Test,” check the error number, description, as well as reason column. This is one of the best tools to always check website status. Binary Canary comes with a free monitoring account that you can use to monitor up to 5 websites at a 15-minute frequency. Whenever the website goes down, you’ll be notified through SMS or e-mail. Try the old fashion way by using the command line program in your windows. Open the command line on the Windows and type the website you want to ping (the website you want to verify if it is down). Another way to check website status online is by using this advanced online tool, which provides adequate information about the status of your website. Unlike the ping method, this tool allows you to get an automatic notification whenever your website goes down. To check if your website is up and running, open host-tracker.com in your browser and insert the URL you want to check within the empty field and click check. Furthermore, ensure you select the “Http” before going further. You will get a detailed result of your website but our focus in on the status of your website. If your website displays information similar to the one below, then the question “Is my website down?” is not valid. Although it may have failed many times, however, must of these has to do with interruption with the internet connection. Do you want to check if your website is up or down? This method is different from the aforementioned ones because it allows you to see the website you are checking. Perhaps you are thinking about what a proxy is. If you use a proxy server to visit a particular website, you will not reach the website from your computer directly. Alternatively, it will first reach a server located in a different part of the world before sending a request to the website in question. Then the result will be displayed on your computer. What you are trying to verify is if the website is available in another country or location. After putting the address of the website, click “Hide Me.” A new window will open with the website you requested to check to show it is loading. If everything loads perfectly, it means your website is up and running. However, if it fails after multiple tries, it means your website is down and requires quick resolution. If you want to monitor the availability of your website always, there are many online services available to do that. Your website may stop running for various reasons including hack or database error. Besides this, your hosting provider may contribute to why your website is down or up, which is why you must find a reliable provider to host your website. The best way to monitor your website status is to get tools that will alert or notify you of the current state of your website. Fortunately, you don’t have to pay any dime because they come free and available for everyone. Your website does not need to get down for a second with these tools as far as you get the notifications. With Uptrends, you can monitor your website from multiple locations and get notified when it is broken through email. The platform has an amazing dashboard that provides essential metrics for our website. It has error breakdown by types, availability chart, and total time taken to load graph. Interestingly, the dashboard is customizable and allows you to export your website data in Excel or PDF. No financial attachment involved in using this service for your website as it comes FREE. Uptime is a performance monitoring and enterprise-ready site availability tool that has amazing features. With Uptime, you get a comprehensive response time reporting from over 30 locations. Additionally, it performs significant security checks with notifications sent immediately. You can receive these notifications through Twitter, Pushover, Webhooks, SMS, Email, and much more. 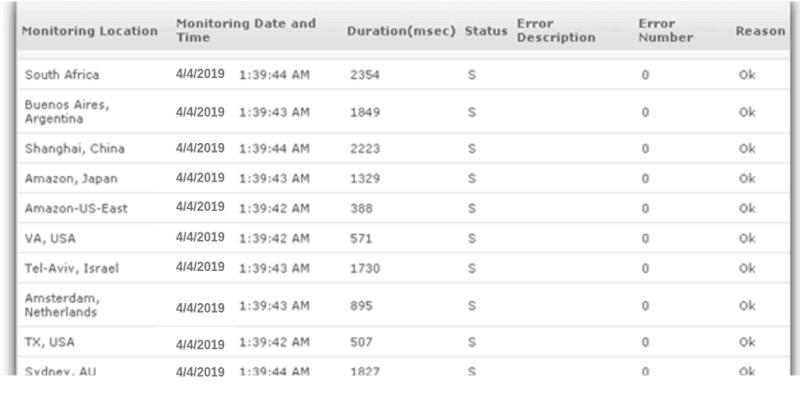 Furthermore, Uptime can monitor your POP, Ping, IMAP, DNS, and SSH. With Freshping, you can monitor 50 websites from 10 different locations within a minute. Does that sound amazing? Of course, it is your complete monitoring solution with important features such as multiple user login, multi-channel notification, integration with other services like Twilio, Slack, Zapier, etc. Freshping allows you to get the status page to announce the real-time incident status of your website to your customers. However, when using the free plan, you get only six months of monitoring data for your website after which you have to start paying to monitor your website. We have saved the best for the last because this free online tool from Google helps you to analyze your website, check the status, and offer suggestions to speed up your website. Google PageSpeed Insights is the power of 3-in-1. However, our focus is on checking the status of your website. To use PageSpeed to check the state of your website is easy. Enter the domain name in the empty field of the Google PageSpeed Insight and click Analyze. If your website is no up and running, it will report, “The website specified cannot be reached.” However, if it is accessible, it will see a detailed score by PageSpeed on the overall state of your website. Ensuring your website is up and running isn’t negotiable especially if you run an e-Commerce website. With the information provided here, you can quickly check the status of your website before consulting the professionals. Interestingly, you can combine all methods mentioned here to gather detail information to be completely sure about the real status of your website. With the above tools mentioned, you can monitor your website 24/7 with notifications and other detailed information. These methods are accurate and reliable to check website status especially when you don’t have access to it. With these free tools, you no longer have any excuse not to monitor your website’s uptime performance as well as its load time. Now, we’ll also love to know your own experience, have you ever used any website monitoring tool we didn’t mention here to ensure your website is up? Please, let us know in the comment section below. Bluehost VPS Review: Why Use VPS Hosting Over Shared Hosting?